Soc Trang (VNA) – Prime Minister Nguyen Xuan Phuc has extended best wishes to Khmer Theravada Buddhist dignitaries and followers in the Mekong Delta province of Soc Trang on the occasion of the Chol Chnam Thmay – the traditional New Year Festival of Khmer people in the south. 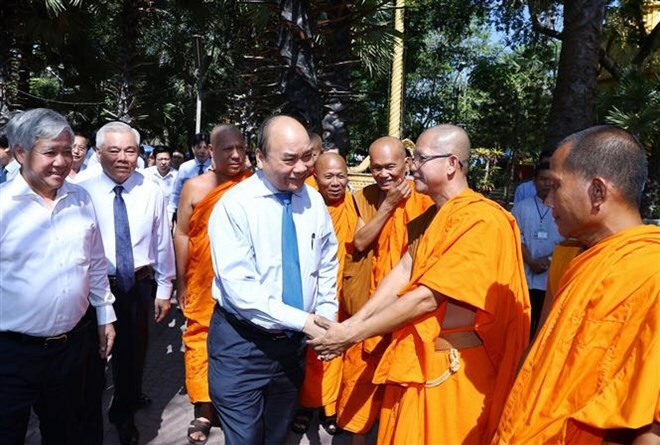 The Government leader visited the provincial Association for Solidarity of Patriotic Buddhist Monks and Pali school, and offered incense at Khleang pagoda in the province on April 6. He informed local Khmer people that thanks to joint efforts of the entire Party, army and people, Vietnam has gained great achievements in the fields of socio-economics, defence, security and diplomacy. The national great unity has been consolidated, and people’s material and spiritual lives improved continuously. These achievements are made possible partly thanks to the contribution by the Khmer community in the south, he affirmed. The leader appreciated efforts by Khmer Buddhist dignitaries and followers and Khmer people to implement socio-economic development goals and ensure the locality’s security and order. He asked local authorities to pay more attention to Khmer people in underprivileged areas.